A tsunami! Filled with bees! About 10 minutes into this film I started to wonder if maybe my editor hates me. After all, last week I was sent the dreadful Death Pool to review and it instantly went on the Worst Films I have Ever Seen ‘honour’ list. I thought it was such a prime example of bad film-making that it could be used in film school as a teaching tool of what not to do. 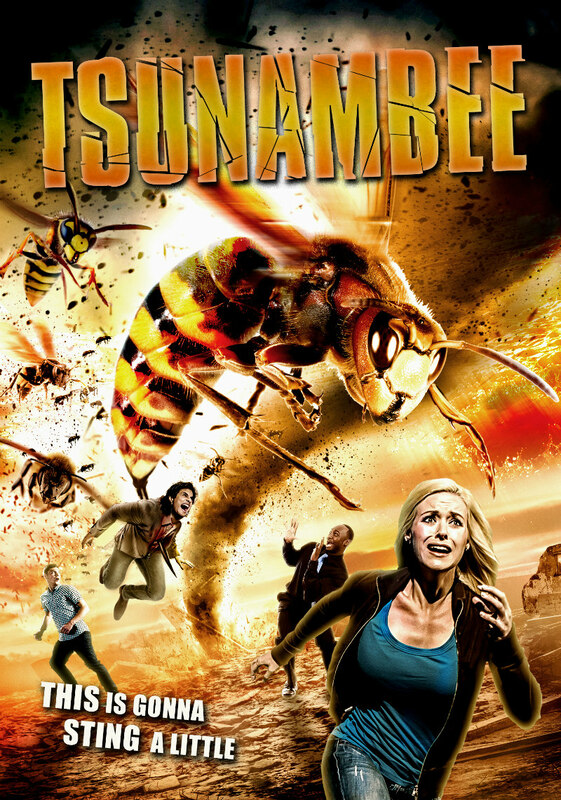 I was wrong, as Tsunambee is literally the worst film I have ever seen. And if any film should be a cautionary tale in class, its this one. The synopsis of this ‘film’ is as follows: (Nb. I have used ‘film’ instead of film as this honestly just feels like a series of unrelated scenes strung together, mixed into a home movie made with friends who are inventing the ‘story’ as they go along.) We open on a strangely dressed disheveled woman who is stumbling about some sort of desert setting with a giant cross. Not sure who she is or how she relates to the story. The next scene is of a group of people acting frightened in what is presumably meant to be a jungle but which actually looks like the local kids park. They are attacked by something black and bee-like after quoting some vaguely biblical stuff. But again, not sure who they are or why they are on this ‘expedition’ so why should I care if they all die totally unconvincing deaths in a park? Next up is a scene where a guy is running to warn another guy about a slow motion walking policewoman coming to kill him. No, I am not kidding. Again, who are these people and why should I care? Next we are plunged into the ‘action’ as three people in yellow (presumably to indicate that they are in a gang) decide to flee the city of LA as it is engulfed in what a news reporter says is ‘like the end of times, in Biblical proportions’… yeah right. They run into some local yokels in a completely random scene that has no build up, and as both rednecks sport ridiculously giant assault rifles and we have no idea what happened to get to this scene, makes absolutely no sense. A policewoman arrives to break up the action and the next thing you know they are on the run from giant bees. There is some stuff about zombies, there is A LOT of stuff about the bible, and none of it is good. The end happens and it makes no real sense and then there are two overlong arbitrary after-credits scenes that do nothing but bore and confuse. The only positive I can say about this film is that the acting by Ruselis Aumeen Perry as the main protagonist is reasonable, and he deserved a better movie. The negatives are many. This film features quite possibly the worst CGI I’ve ever seen; I went to film school and watched my fellow students attempts at CGI with a PC, and this is worse. The bees are barely convincing as bees, let alone convincing as something that is actually present in the scene. When the bees attack, it's unintentionally hilarious how utterly unbelievable it is; they also don’t behave like animals with a singular purpose but swarm randomly everywhere, so the film doesn’t even get the ‘chasing after running prey’ thing right. Even the opening credits are wrong, with the action stopped to fill the screen with individual mentions for everyone from the casting director to special effects supervisor – honestly, way to kill any kind of momentum you may have built up. The music seems to have been laid in randomly with no sense of what is happening onscreen, and the film quality is so bad that it bleaches out all sense of reality. The acting is abysmal, with Stacy Pederson as Officer Feargo and Maria DeCoste as the main guy's girlfriend (don’t make me watch it again to get her name – please) taking amateurishness to whole new depths. Scenes change from day to night but the natural light is clearly wrong or non-existent; there’s a scene where it's snowing but they are obviously not cold even though they are wandering about in t-shirts. Meanwhile in the same scene there is smoke billowing across the screen from somewhere off camera that is not explained; close ups often cut off hair or chins as if it were your doddery old grandmother taking a photo rather than a ‘film-maker’. Speaking of the writer/director Milko Davis, I have one giant piece of advice for him – ESTABLISHING SHOTS! You cannot have people wander into scenes with no sense of where they were in reference to the scene. You cannot have people conversing in singular close ups without first establishing where they are in relation to each other. You cannot have hands randomly pick up guns from off screen without first establishing who is doing the picking up. There are so many scenes where one character says something to another, but because the filmmaker did not first establish who they were looking at or who was even in the room, the audience has no idea who they are talking to. It's basic filmmaking! This is not even enjoyable in a ‘so bad it's good’ way, as it takes itself far too seriously. And I’m sorry to be the bearer of bad news but despite the title, we never see a tsunami of bees. Last week I said Death Pool was diabolically bad. And it was. But compared to this it was veritable Shakespeare, because Tsunambee isn’t just bad. It’s excruciating. 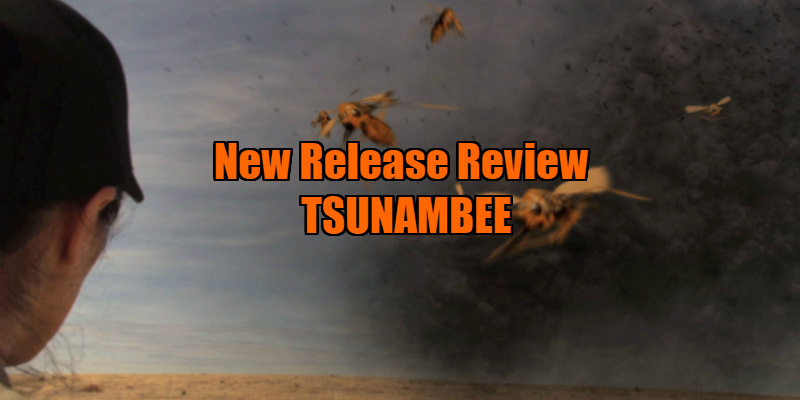 Tsunambee is on VOD now.